Within the rather monotonous landscape of new fantasy novels, The Whitefire Crossing (Courtney Schafer‘s literary debut and the first installment of The Shattered Sigil trilogy) has enough interesting elements to make it a good choice when compared to a lot of his companions in the bookshop shelves. However, despite its strengths, the book does not fly as high as it could have done it because of it being too predictable, without managing to escape the comfort zone that seems to act as a gravity well for the imagination of many genre authors. The plot is tight and simple. Dev is an outrider working for commercial caravans traveling the mountain route that goes from Ninavel to Alathia. This work allows him to smuggle magical charms to Alathia, a country in which magic is strictly legislated. His latest smuggling assignment, though, is somewhat different: he is asked to help young Kiran to reach Alathia posing as his apprentice, but the journey will get complicated when Dev discovers that Kiran has lied about his true identity. The first half of the novel is devoted to Dev and Kiran’s flight through the mountains and the Whitefire crossing, trying to reach the Alathian border while pursued by a virtually omnipotent foe. The relationship between Dev and Kiran is built by continuously jumping from the point of view of Dev to Kiran’s, allowing the reader to stay one step ahead of both characters and getting him to enjoy their mistakes and hesitations. The author has chosen to shift from a first-person narrative when Dev is the main character to third-person in Kiran’s point-of-view. While I’m not totally convinced of this being the more elegant strategy from a narrative standpoint, it certainly leads to an interesting dynamic and stresses contrast between the voices of both protagonists. One of the best executed aspects in the relationship between Dev and Kiran is their gradual discovery of those things they have in common and how these things challenge their prejudices. The part of the novel devoted to the journey through the mountain comes to life thanks to the ability of the writer to convey her passion for mountaineering and climbing and making it into the fabric of the story. This, added to the sense of impending doom from the enemy that persecutes the protagonists from far away and the resulting suspense lead to a first section of the novel that works like a clockwork and oozes personality, owing more to the interaction between the characters and their environment than to the specifics of the plot. In the second half, however, the story takes a not completely unexpected turn and shifts its tone from that of a “road movie in the mountain” to a rather mainstream fantasy adventure set in the city of Alathia, losing much of its uniqueness. Where the enemy pursuing Dev and Kiran in the mountains was immense because of his remoteness, their new nemesis in Alathia is like a caricature of a cartoon villain; where the mountain and the Whitefire Crossing were lively and attractive scenarios that challenged the skills of the protagonists, Alathia is a medieval city poorly drawn. Overall, the Alathian arc lacks uncertainty and the reader never begins to doubt the ability of the protagonists to overcome the situation, although some surprises at the end lead to an interesting starting situation for the second novel in the series, The Tainted City. The Whitefire Crossing is a good debut novel and a good start for an attractive series with some good characters and intriguing elements. The author’s prose is perfectly adequate and does not stand between the reader and the story. Courtney Schaffer does not delve in some of the many interesting ideas raised while worldbuilding (The idea that children in Ninavel are able to practice a kind of magic that goes away when they reach adolescence is a favorite of mine) but they remain as seeds for the next installment of the series. 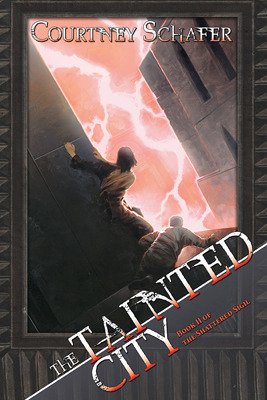 I, for one, am determined to read The Tainted City sooner rather than later.